WBC middleweight champion Saul Canelo Alvarez is going to need to decision whether he wants to defend his WBC title against his mandatory challenger Gennady Golovkin or not. 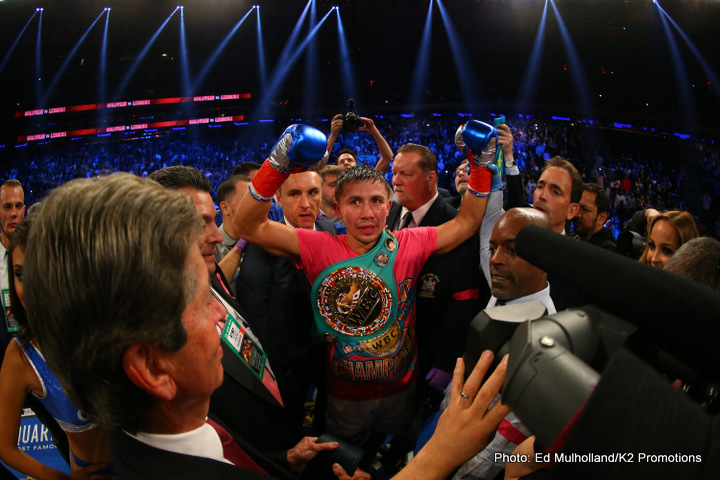 Golovkin’s promoter Tom Loeffler says that they will negotiate on weight for the fight. The decision not to negotiate on the weight for the fight likely comes from Golovkin himself rather than Loeffler. Letting Canelo, a much more popular fighter, have his way in the negotiations would seem like a normal thing for most fighter’s management to do. If Canelo wants a weight advantage, then it would make sense to allow him to have the advantage in order to get the fight. Golovkin is said to be lighter fighter than Canelo, so it shouldn’t be a big deal for him to agree to the 155lb catch-weight that Canelo requests for the fight. The catch-weight is something that is probably more hurtful to the young 25-yer-old Canelo than Golovkin. Canelo might be too young to realize that it doesn’t help him to fight at the 155lb catch-weight, when he’s rehydrating to 175 to the 180s. Golovkin and Loeffler should just let Canelo have his way when it comes to the weight for the fight. He doesn’t seem to realize at this point that it’s him that is hurt by fighting at 155 rather than his opponents. The 155lb catch-weight only makes sense if Canelo is fighting a welterweight or junior middleweight, and he wants the weight as a goodwill gesture. But as far as fighting a real middleweight, it’s pretty stupid for Canelo to be fighting at 155lbs with him being as big as he is. It’s probably not too good for his body either to have to drain down so far to get to 155lbs. “It’s in the writing that Canelo fights Gennady or his status as champion will be vacated by the WBC,” Loeffler said.